With its romantic canals, tranquil parks and cobbled streets, there are so many reasons to take a romantic break to Amsterdam. 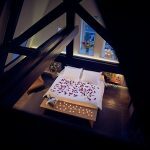 This year, The Set’s Conservatorium has created a romantic ‘Love Weekend Package’, perfect for the month of love. The Love Weekend Package offers a special two-night stay in Conservatorium’s exclusive ‘I Love Amsterdam’ Suite, the hotel’s cosiest room with loft-like features. Lovers can enjoy the oversized bathtub with a glass of bubbles whilst looking out onto the world-famous Rijksmuseum through floor-to-ceiling windows. Champagne can also be enjoyed on the private rooftop balcony deck for picturesque panoramas of the city across Amsterdam. An elegant pastry creation will be offered to each couple, and both mornings guests can wake up to a romantic Champagne breakfast in bed. 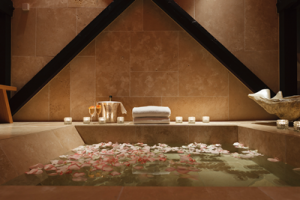 Couples will enjoy a VIP shopping experience with a shopping gift card at the luxury department store ‘de Bijenkorf’, followed by a relaxing Oenotheraphy le Grand Cru treatment (140mins) in the couple’s treatment room at Akasha Holistic Wellbeing. The next day, a private canal cruise will await the couple and take them on a two-hour romantic journey with a drop-off at a restaurant of their choice. The Conservatorium ‘Love Weekend Package’ is available from €5,780 per night in the I Love Amsterdam Suite including VAT, excluding 7% city tax, subject to availability.